The theme for this week's WFMW is "greatest hits." Looking back over my old blog posts (back when I was my only blog reader! ), I came across a post on making red icing. This was a HUGE headache for me when I was first starting to make cookies. Red icing is probably the most difficult to make. It looks too pink, too orange, or too dark. I've fallen in love with AmeriColor's Super Red gel paste coloring. It doesn't take as much to get a nice red and doesn't have the off-taste like some others (Wilton, at least to me). 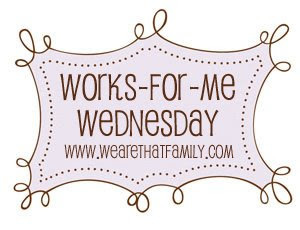 Go on over and check out the other "greatest hits" on Works for Me Wednesday hosted by We Are THAT Family. Last year, after reading this post, I bought Americolor gels for the first time... I love red and black, and you are right: there's no after taste and colors do get more intense if done a day in advance... oh! and I was a lurker at that time, Bridget... Have a nice day! Is this the icing you used in your header? red and black icing, hard to achedive but so pretty to use. Donna...for black, I use the same brand's "Super Black." It works great and just a little goes a long way. I get the icing a dark gray and it turns to black on the cookies. Jennifer...yep, that's how I made it for the header cookies. Do you have to make your own icing for this to work? Or can I just buy canned frosting (duck) and go from there? I tried making red with vanilla frosting and red food coloring before and I ended up with pink LOL I'm not the greatest at baking, as you can tell. Who knew?? I had no idea that the icing pictured would turn into the deep beautiful red! !Good tip! This is a good tip. I have to make a Mario cake for my son's birthday this year and I was wondering how I would do the red shirt. That's good to know. I always struggle with red icing around the holidays. Pink Christmas cookies just aren't the same! I will be giving that brand a try! Thanks for the info. Where do you recommend purchasing AmeriColor food coloring? I have never seen that brand in the stores in FL. I just found your site through WFMW and I love it! I wish you were MY next door neighbor! I'm so afraid of red icing. Oh my, I think I just found my favorite blog. The recipes look yummy. Thanks for stopping by for WFMW. As far as what I do with DS Lego creations, he doesn't want to keep them. He builds them, plays with them, and then takes it apart and builds a new one. Or I take it apart when I'm cleaning. I'd go with your suggestion, line them up. He has to run out of legos at some point. Either he will stop building or start dismanteling. Alexia...I'm sure it would work with canned icing. I've only used it with royal icing (which dries hard) for decorating cookies. Somebody recently asked me about red icing - this is perfect! Hi Bridget. Love your site, both of them, in fact!! I am making pencil and apple cookies for my kids' teachers this year. I made my "red" icing last night but it was still pink this morning. You say a little goes a long way but what's a little. I made one batch of your royal icing recipe and had to put at least 10 decent sized drops of Super Red in there and still don't have a red. How long does it take to turn it's true color after you mix in the gel paste? Thanks for all you do!! Well, it depends how much icing you are dealing with. I stay pretty true to that color you see in the picture. It should turn red as it's drying....if you are outlining in red, it should start looking rd pretty quickly. Just stay away from getting your icing REALLY dark red. There is where it will dry too dark and you'll run into more problems with bleeding. Hope that helps. in my personal opinion, I like to prepare the color of my recipes, different to many other that buy a artificial color, I like to extract in natural way the color. This is really awesome blog post found here.... You really did a great job, Thanks very much for sharing this information here. Hi..I never seen red color for icing..Its totally different..really cool color..Thanks a lot for sharing..
Im grateful for the article. Thanks Again. Fantastic. Hey your blog is really awesome. great post you shared with us. I like it. Superb article.Very informative post. Thanks for taking the time to share your view with us. I've never done Royal Icing before, this is my first year straying from the tubes of frosting at the grocery, and I ordered the Ameripaste gel food colors from King Arthur Flour. In my ignorance, red was the first color I attempted, and when my icing turned that salmon-orange color I panicked (it looked JUST LIKE your picture). I made a couple of orange noses on snowmen and some jumpsuits on a few ninjabread men (don't ask -- I have boys!) and ran to the Oracle of the Internet to figure out how the heck to make icing red instead of pink or orange. I started using the icing immediately, but I still have a lot in the bowl. Should I wrap it up airtight and look at it again tomorrow, or will the frosting darken to more of a red once it's already on the cookies? I can't have orange Santa suits for Christmas!! I baked it, It was so delicious. Pleasant posts. I have just found the desired information in your blog and wish to say that I am really enjoying reading your blog posts. Nice post. Great blog. Please keep continue sharing your great ideas. I would like to read your blog every day Thanks. You have been shared really an interesting information. Keep sharing more and more..
Great font... gives you a great feeling there is a lot of useful data above! Thank you for sharing these resources. Hopefully I can use them to promote my new blog to prominence! Folks, this recipe looks fabulous. What is with these weird comments? In entire life first time I have seen this kinds of recipe. I love to eat so that's why I travel in various countries for tasting the different culture foods. I am a research-aholic, and in my searches for baking, frosting, cookies, I seem to always find Bake at 350, and that's something to say about you! I've made your fondant (love your wedding pic, BTW), and it was the easiest recipe ever. I'm going to work it, roll it out and stencil it today. Now I am in a quandary over this "red" icing thing. I have Americolor Red Red, and I am only using a very small amount of butter cream frosting (approx 3 T) for stenciling purposes. I've already used a full drop plus a bit more, and I have this lovely orange color, but not the deep red I was envisioning. So you're saying to just let it ride and it will turn Valentine red? Love, love, love your blog!